Whether you're building or renovating your home, you may want to consider travertine tile for not only your floor, but also outdoors on your patio or garden path, as well as showers, counter tops, or even wall coverings. Also known as travertine limestone or travertine marble, travertine is neither limestone nor marble. Travertine is sedimentary stone formed when minerals dissolve in ground water anddeposited on the surface by geysers, rivers and natural springs. Escaping water vapor inside the stone, leaves behind small holes and pits which characterize the tile. In Croatia, travertine deposits have formed 16 huge natural dams in Plitvice Lakes National Park. Travertine has been used in many well-known buildings, but perhaps the most well known of all is the Roman Coliseum. Natural travertine is filled with multiple holes, calicum deposits and a rugged look. When it is cut into tiles, the stone can take on a number of different looks and appearances. Only the hardest travertine can be polished. With some travertine tile, epoxy is used to fill in the porous cavities to make it smoother. While some homeowners like the smoother look and feel, note that the compound that is used to fill in the holes will not wear like the stone and could color differently over time. This may not sound attractive, but it could prove to be a wise choice if you like contrast on the floor. Honed (Matte) - This is the most common type of finish for travertine tile. Honed travertine tiles offer a flat and smooth finish that has a matte look to it. Polished (Shiny) - A polished travertine tile has a flat and smooth finish like honed travertine, but it has a shinier look. Brushed - Brushed travertine combines the benefits of a flat surface with a bit of texture by heating and brushing away the weaker particles in the stone. Tumbled - Because its flat, textured surface reflects the least amount of light, tumbled tile is popular in rooms that get a high amount of natural light. Cross-cut - Travertine that is cut against the grain will appear to have long veins, rather than shallow holes, resembling marble rather than limestone. Pure travertine is white, but due to organic impurities and iron deposits that have filtered into the travertine while it was forming, travertine ends up with many different shades of earth tones and varying textures. 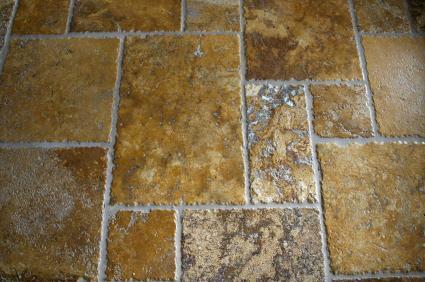 Most travertine is tan to brown in color, but some stones are also gold, red and gray. All travertine will vary in color from lot to lot and from piece to piece like all natural stone. Polished and honed travertine may appear to be deeper in color than tumbled travertine; bring out the color in the tumbled stone by applying a color enhancing sealer after installation. Do not use citric acid-based cleaners or vinegar to clean your travertine as they can erode and stain the surface. Holes must be filled with either epoxy or grout to help maintain the integrity of the stone. Do not leave the holes open after installation. Seal the stone regularly with an impregnating sealer made for porous stones to impede staining. Travertine is a softer stone than marble or granite. Do not cut on it or drag heavy furniture across it because this can scratch the stone. Use a white, latex modified adhesive when installing travertine to help prevent discoloration of the stone. Seal the stone prior to grouting and use a sanded grout for the most natural appearance. Use a tile wet saw to cut the stone. While it is softer than granite and marble, it is much too thick to cut with nippers or a carbide tipped pencil. Do not use travertine in wet areas such as showers, because it is likely to absorb water and discolor over time. If the fill comes out of the tile over time, replace it with fresh grout in a color to match the stone for best results. While travertine looks much more rugged than other stones, with its naturally rustic and marked appearance, it is softer and more easily harmed than other stones. Weigh the benefits of its soft, brittle beauty against its higher need for maintenance when making your choice. When installed and cared for properly, a travertine installation will look beautiful for years.